Fatal Puzzle - There Are Inkspots On My Page! I received a copy of this book in exchange for an honest review. You can find this, and other reviews, on my blog. It took me a long time to write this review, not because I didn’t enjoy the book, but because I found it difficult to get my thoughts in order. 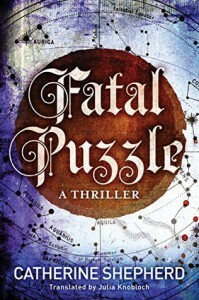 Fatal Puzzle is actually two intertwined stories - one half is set in 1495, where women are being murdered and mutilated to complete a puzzle, and the other takes us to the present day, where there appears to be someone copying the medieval murderer. I really enjoyed both stories, they were engaging and entertaining from start to finish, and there wasn’t a lot of mucking around with unnecessary side plots - the book isn’t even 200 pages long. I did find the writing style a bit jarring. It reminded me very much of a young adult novel, which is definitely not a bad thing. I did find it quite jarring in some sections though, where victims and scenes were described in quite graphic detail. I also would have enjoyed both stories fleshed out into their own individual pieces, as they were both very interesting separately, but the length of the book means that everything is shorter by necessity. That said, this appears to be book 1 in a series, and I’m very interested in seeing what Catherine Shepherd does next.